One of the most thrilling experiences when you visit Playa Nicuesa Rainforest Lodge in Costa Rica is seeing monkeys. It is so much fun to watch the cute, miniature-sized Squirrel Monkeys jump and play, and marvel at the ingenious antics of clever White-faced Capuchin Monkeys. Youâ€™ll never tire of watching Spider Monkeys swing gracefully through the trees with their long arms, legs and tails. And the haunting call of Howler Monkeys will greet you at dawn, and close your day at dusk. There are only a few places in Costa Rica where you can see all four native species of monkeys â€" Playa Nicuesa on Golfo Dulce, the Piedras Blancas National Park, Osa Peninsula and Corcovado National Park. Out of 250 species of primates in the world, 68 are in the Americas. Native to the forests of Costa Rica are the Central American Squirrel Monkey (Saimiri oerstedii), the White-faced Capuchin (Cebus capucinus), the Mantled Howler Monkey (Alouatta palliata) and Geoffroy's Spider Monkey (Ateles geoffroyi). All four kinds of monkeys are active during the day and live in the treetops. You can see them using their strong limbs and prehensile tails (almost like a third hand) to swing between the trees when you walk the trails at Playa Nicuesa Lodge or on a visit to the Piedras Blancas National Park. On the kayaking tour in the Esquinas River mangrove estuary, you can frequently see White-faced Capuchin Monkeys and also Squirrel Monkeys. The smallest of the Costa Rican monkeys is the Central American Squirrel Monkey. Adult males average 0.8 kg (1.8 lb) and adult females about 0.7 kg (1.5 lb). Once listed as endangered, in 2008 the International Union for Conservation of Nature (IUCN) revised its status to â€œvulnerableâ€. Squirrel Monkeys have the most restricted range of living of all the monkeys, found only on the central and south Pacific Coast of Costa Rica. The other three species have wider ranges, being found in forests from Mexico to Ecuador. 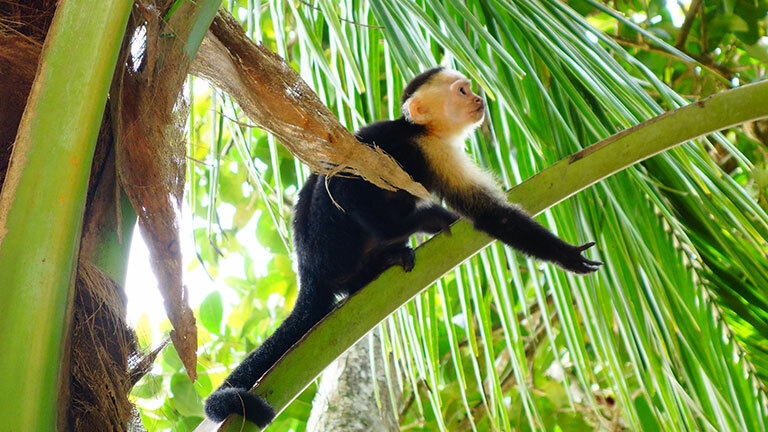 The White-faced Capuchin is the second smallest monkey in Costa Rica, while the endangered Geoffroy's Spider Monkey is the largest. The Mantled Howler is the second largest and is most known for loud calls made by males, especially at dawn and at dusk that can be heard for several kilometers. Playa Nicuesa Rainforest Lodge is located in the pristine rainforest on a remote beach of the Golfo Dulce. A TripAdvisor Certificate of Excellence winner, the Costa Rica eco-lodge in has its own 165-acre private preserve bordering the Piedras Blancas National Park. August and September bring whale-watching season to Golfo Dulce, where you can see migrating Pacific Humpback Whales that come to Costa Rica's warm waters to breed and give birth.